William C. Jayne, co-owner of the Jayne and Mason Bank, was village president, village treasurer and a member of the Board of Education. The Jayne and Mason Bank opened in the year 1900 on South Avenue in Webster and six years later moved to a new larger building at 11 E. Main St. Business increased during the early 20th century. 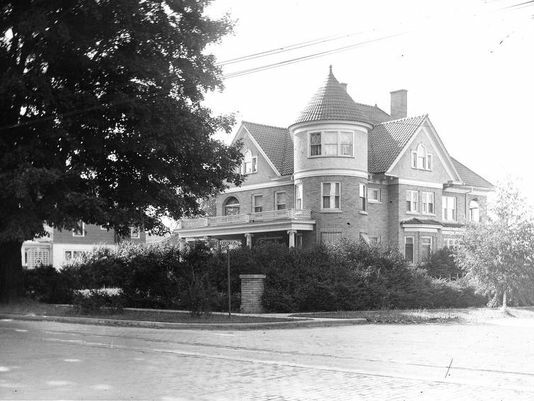 Jayne built a home of stately beauty at the corner of East Main Street and Curtice Park in the village of Webster. Today, this home at 183 E. Main St. is listed on the National Register of Historic Places. The William C. Jayne House is a magnificent brick home built in 1917-18. Designed by architect W.F. Sharp in the Queen Anne style, the house features a large, round corner tower. Construction materials include narrow Roman brick, cast stone, stucco, wood detailing and stunning ceramic roof tiles. Upon entry through the front door and vestibule, you arrive in a foyer. A chestnut staircase, stained glass windows and a picturesque window seat complete this space. Two chestnut columns separate the foyer from the living room with its marble fireplace, original wall sconces and a decorative ceiling of horse hair plaster. Beamed ceilings in the library and hexagonal floor tiles can be found in the kitchen and butler's pantry. The second floor of the home features five bedrooms (the master bedroom has a fireplace), two full baths and three porches on the second floor. By 1935, the property was owned by William Partridge. His family moved in and during this time rented one bedroom and half of the garage to the New York State Police as a substation. Later, Bill Netzman owned the home and rented it as well. The home's grand size and village location made it perfect for the current owners, Granville and Silvia Chambers. They purchased their home in 1969 and with the expertise of designer Harriet Thomas and craftsman Felix Staudenmeier, the Chambers have carefully maintained the home's integrity while raising their family in Webster, "Where Life is Worth Living."